Multiple H.264 (High profile) streams and JPEG streams ensure simultaneous real time monitoring and high resolution recording by new “UniPhier®”, Panasonic’s proprietary System LSI platform. 30x optical zoom 90x extra optical zoom at 640x360 resolution with 12x digital zoom enabling 1080x zoom. VIQS (Variable Image Quality on Specified area) technology allows the designated 2 areas to retain higher image quality while the excluded area will have a decreased image quality, which enables to use lower image file size and bit rate. VIQS can be set on preset position (1 to 8) and except preset. Selectable light control modes: Outdoor scene / Indoor scene (50 Hz) / Indoor scene (60 Hz) / Fix shutter Indoor scene (50 Hz / 60 Hz): Flicker caused by fluorescent lightning will be automatically compensated. Advanced auto tracking: The camera automatically pans and tilts to follow a moving subject and keep it in the centre of the image. PTZ control can be taken very smoothly on the user friendly GUI with 16 speeds pan/tilt and new “Drag and Zoom” operation enabling finer control. 256 speeds available for system with WV-CU950 system controller. Privacy Zone can mask up to 32 private areas, such as house windows and entrances/exits. H.264 max. bit rate / client and Total bit rate control allows flexible network traffic management. Frame rate priority mode controls bit rate and compression ratio to provide the specified frame rate. Built to have the utmost picture quality the WV-SC588 will not be provide with a dome cover to achieve the highest quality possible, Panasonic System Communications Company Europe (PSCEU) is proud to introduce the latest addition in the i-Pro SmartHD range of surveillance solutions, the WV-SC588. With full ratification from ONVIF, the specification that defines a common protocol for network video devices including automatic device discovery, video streaming and intelligence metadata, PSCEU promises installers and end users some of the most advanced features and best return on investment available in the security technology market today. With Ingress Protection Rating certified at IP5x, the new Panasonic WV-SC588 takes good resistance against the elements to the next level by guaranteeing dust tightness, with no ingress of dust possible. This means that when located in highly inhospitable positions like high roofing edges, the WV-SC588 will provide the continuity of service needed to meet the highest expectations in the security industry. Up to 1,920 x 1,080 HD resolution images are delivered across the network through multiple H.264 and JPEG encoded streams for simultaneous real time monitoring and HD recording which is powered by UniPhier®, the proprietary Panasonic system LSI platform. At 1080p full-HD resolution, progressive scan images are produced at no less than 30 frames per second, enabling security professionals to see every detail and movement necessary to provide the best possible surveillance recording and monitoring and resulting in better delivery of total security management. With a massive optical zoom range of 30x as standard, plus a 12x digital zoom capability it is possible to achieve up to 1080x zoom in VGA resolution . What’s more, with an advanced track and trace feature an electronic handshake between cameras sends an alarm to up to 8x cameras in sequence to pick up the surveillance of a suspect moving between camera coverage zones. 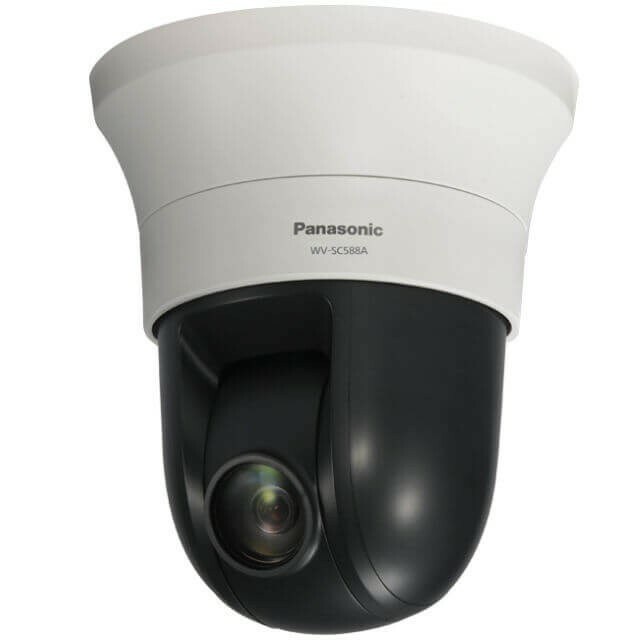 Plus, with Panasonic MEGA SuperDynamic Range and ABS (Adaptive Black Stretch) technology on board, the WV-SC588 delivers 128x wider dynamic range compared with conventional surveillance cameras. Face Super Dynamic technology is designed to ensure the clearest facial images are reproduced, whilst high sensitivity functionality is possible with 0.5lux sensitivity in colour mode and 0.06lux in mono at F-stop 1.6 aperture providing true 24 hour day/night performance. The latest in the Panasonic i-Pro SmartHD range comes fully supplied with all accessories including alarm cable, connector kit and front and rear sunshields, every detail has been taken into account and it’s clear that as the latest Panasonic intelligent i-Pro SmartHD WV-SC588 will be specified by the smartest of installers seeking to deliver the very best indoor surveillance available.